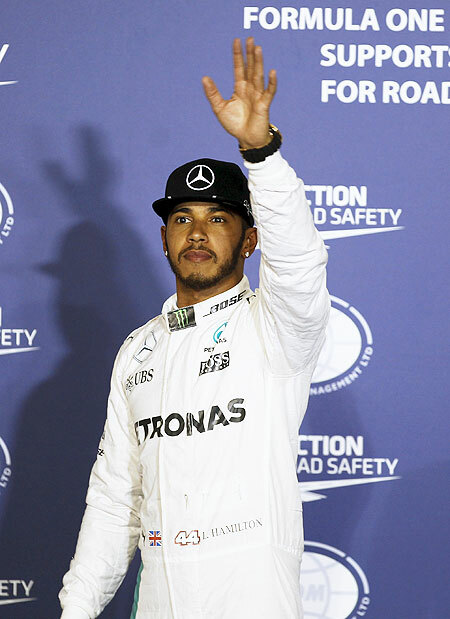 Formula One champion Lewis Hamilton was reprimanded at the Bahrain Grand Prix on Saturday for reversing his Mercedes in the pitlane moments after qualifying on pole position ahead of team mate Nico Rosberg. Stewards said in a statement that the Briton had escaped a more severe sanction "due to the fact that no clear instruction was given to the driver on where he should park the car after qualifying". Hamilton told reporters he had slowed down, well inside the speed limit, before he entered the pitlane. "Usually there is a guy standing there telling you which way to go and basically there was nobody there, or the guy that was there was not looking anywhere, so I thought perhaps I could go in front of the group," he said. "I pulled up ahead of them and no-one was there. I was on the blue area where we take a photo at the end so I just reversed a bit and stopped."